Digi-Schlock: PROM NIGHT (1980) (Synapse Blu-Ray) – Schlockmania! 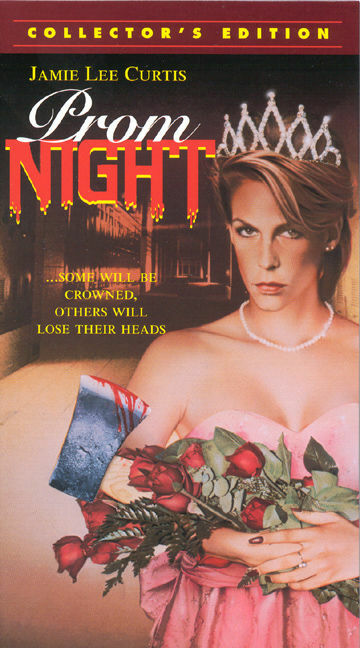 There’s a big market amongst the horror fanbase for special edition releases of ’80s slasher films – and said fans have been wanting a special edition of Prom Night for years. Synapse is the company that finally picked up this gauntlet and the results are a two-fisted success: not only it is the best this film has ever looked on home video, it also offers an array of extras that will make slasher fans smile. The new transfer done for this set is, in a word, beautiful. Forget the subpar DVD transfers of the past – the 2K restoration done for this disc offers a gorgeous image free of defects. The colors are rich, the details are plentiful and the transfer has no problem dealing with the hazy, diffused style of photography the film favors. It’s hard to imagine anyone doing a better job with this visually tricky title. In terms of audio, both 2.0 mono and 5.1 stereo remix tracks are offered in lossless form. The 5.1 track was used for this review and it’s a good one that adds some choice direction effectsal and makes great use of the disco music during the prom scenes. The disc also offers an array of extras. A commentary track featuring director Paul Lynch, screenwriter William Gray and moderator Pan Jankiewicz kicks things off. Lynch needs little prompting and drives the track nicely, offering thoughts on virtually every cast member – it’s interesting to hear why Robert Silverman played such a small role – and enthusiastic accounts of how different sequences were shot. Gray speaks up on a few script-oriented matters, including heckling the added subplots he didn’t write, and Jankiewicz offers fannish enthusiasm (though he gets obnoxious at times while teasing the excitable director). In short, it’s a brisk track with plenty of info and fans won’t be bored listening to it. The centerpiece of the extras is “Horrors Of Hamilton High,” a 41-minute retrospective interview piece on the film from Red Shirt Pictures. Again, Lynch guides the piece as he reveals how he came up with the concept and the way Jamie Lee Curtis sought out her role. 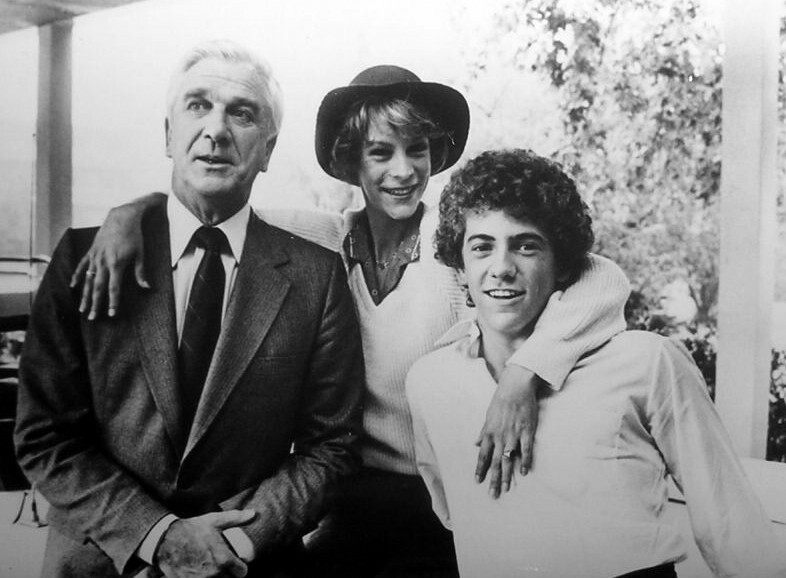 Several cast members, including Michael Tough and Mary Beth Rubens, are included and they all pay tribute to the kindness of Curtis and the jokester proclivities of Leslie Neilsen (there are many tales of his prankish use of a fart noisemaker). And that’s not all there is to this piece: FX man Warren Keillor trots out the film’s severed head prop to describe how this big effect was done and composer Paul Zaza tells a great tale about he ended up writing a half-dozen disco soundalike tunes for the score in just five days. Elsewhere, there are fond tributes to the moxie of sadly departed producer Peter Simpson and a fun closing anecdote from Tough about how his kids have had him trot out the killer’s mask to play the villain at their proms. It’s a fun, fast-moving piece that slasher buffs will enjoy. Next up is a barrage of promotional material. The theatrical trailer is a fun spot that sells both the slasher and disco elements of the film with equal fervor and a set of surprisingly ambitious t.v. spots all use unique narration and different story hooks, with the common themes being prom footage and the menacing phone caller. Two 30-second radio spots borrow narration from the t.v. spots but use snippets of music and dialogue to crafty effect. Finally, an impressive motion image gallery uses both versions of the film’s killer disco theme tune as backing music for an array of stills, lobby cards from three countries, tv debut ads, the Japanese pressbook and even the rare Japanese soundtrack album. Also included is a series of scenes used in the t.v. broadcast version of the film, with a video intro from editor Michael Maclaverty to set up how and why these snips were added to the film. Just under ten minutes of scenes are included, including a subplot with a daft temporary secretary, a few scenes designed to cast the mom as a potential killer and a fun red-herring bit with Neilsen chopping up firewood! The final inclusion is an impressive 23 minutes’ worth of outtakes from the film. These trims mostly offer alternate takes and different angles for scenes in the film, including lots more of the disco and stalking sequences. You’ll get a good look at how the big decapitation effect was done, a brief glimpse of Lynch directing the finale and a wide shot of the ax-swinging dance floor confrontation that allows you to appreciate how well it was choreographed. In short, Synapse has done well by this cult fave slasher, dishing up a dazzling transfer and plentiful extras. If you’re a slash-fanatic, better clear out room on your blu-ray shelf for this edition: it’s the only one you need to own. 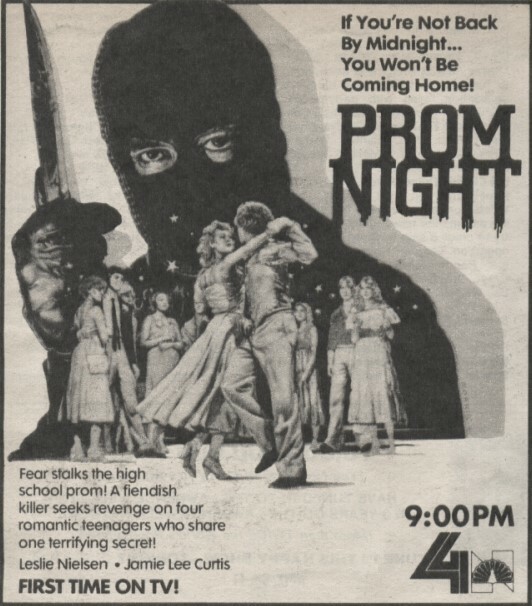 To read Schlockmania’s film review of Prom Night, click here.